For the 18th year in a row, the U.N. General Assembly has voted to condemn the 47-year U.S. embargo against Cuba. United Nations (CNN) -- For the 18th year in a row, the United Nations General Assembly on Wednesday voted to condemn the 47-year embargo against Cuba by the United States. The draft resolution was passed by a vote of 187-3, with 2 abstentions. 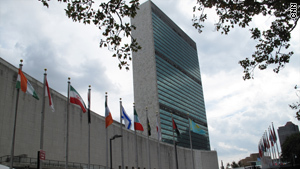 Only the United States, Israel and Palau voted against the measure. Micronesia and the Marshall Islands abstained. The yearly vote has become almost a ritual, but has not changed the United States' stance toward the communist island nation. Washington severed diplomatic relations with Cuba in 1961 and has had the economic embargo in place since 1962. Wednesday's vote was the first with President Obama in office. Obama has taken some steps to thaw relations with Cuba, but extended the embargo in September. Since taking office, the Obama administration has lifted restrictions on Cuban-Americans traveling to the island and sending remittances to family members there. The United States also shut down a ticker atop the U.S. interests section in Havana, Cuba, that had since 2006 scrolled anti-Cuba slogans in 5-foot-high crimson letters. In July, U.S. and Cuban diplomats held their first talks since 2003 on Cuban migration to the United States. Despite the changes, the U.S. stance remains that the embargo will not be lifted until political and social changes are seen in Cuba.